The dramatic success which magnetic resonance (MR) imaging has achieved in the diagnosis of diseases of the central nervous system has not been mirrored in abdominal applications. Problems associated with MR imaging of the abdomen arise almost entirely because of the artifacts secondary to gross physiological motion (e.g. respiration, peristalsis, cardiac pulsation). In addition, lack of a suitable contrast agent for marking the bowel, and inferior spatial resolution in comparison with computed tomography has limited the use of MR imaging in the abdomen. Recent introduction of fast gradient-echo techniques (scan time approximately 1 s) and echo planar MR (EP-MR) imaging (scan time <100 ms) has allowed radiologists to acquire motion artifact-free MR images1,2. 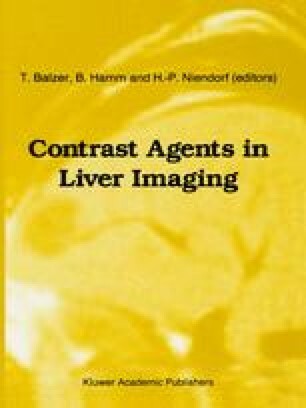 In this chapter, we shall review the potential utility of fast imaging techniques, particularly EP-MR imaging in evaluation of the liver.